April is National Grilled Cheese Sandwich Month. An entire month honoring grilled cheese? Well,let the celebration begin, as though grilled cheese sandwiches needed any excuse to appear in my galley. 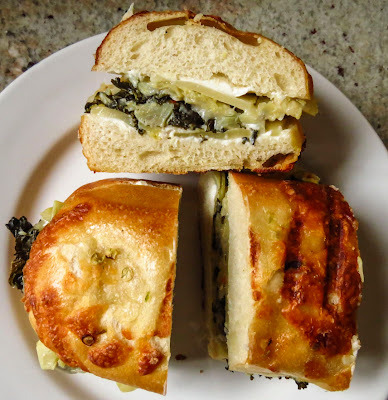 Just thinking of that ooey, gooey goodness melted between crunchy layers of grilled, buttered bread brought on hunger pangs. 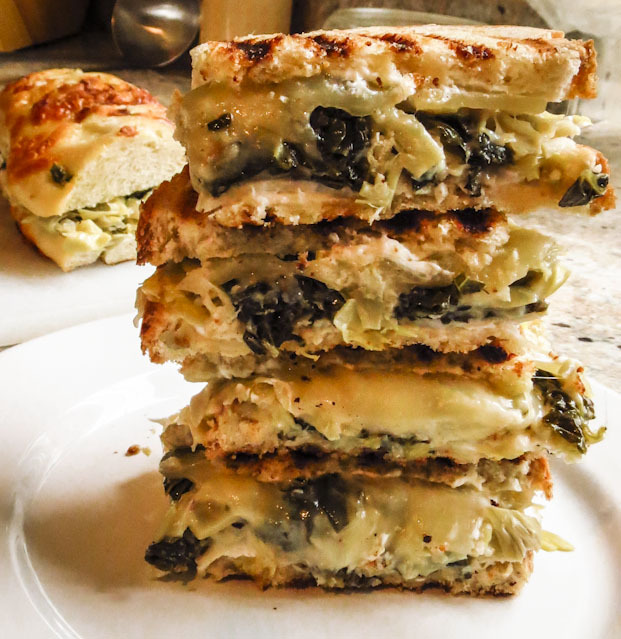 The cravings got serious when I spotted Joy the Bakers's post for a Spinach and Artichoke Grilled Cheese Sandwich. Her filling ingredients were a riff on a favorite appetizer, Spinach and Artichoke Dip. Just one look at the photo of stacked sandwiches and I knew I had to grill up my own version. Similar ingredients lurked in my refrigerator, though I had to get creative with a few items. Kale substituted for spinach, the heat from Crimson Fire (WSU's version of pepper jack) replaced the sriracha's kick, and I skipped completely forgot to add the sour cream. Deli-sliced turkey was a last-minute addition, a spur of the moment inspiration, but was totally unnecessary. Any trace of turkey flavor disappeared as though it wasn't part of the cast of players; it's mild flavor couldn't stand up to the bolder tastes of cheese and peppers. I built one sandwich on a jalapeno & cheese-topped mini baguette and a second one on multigrain sandwich bread. Grilling the baguette was little tricky. The rounded top tried to roll over on the grill pan and a sandwich weight (aka bacon press) slid right off. No matter, the cheese melted and the filling ingredients blended together into a delicious cohesive mass. Tangy yet mellow, smooth and crunchy in every bite, this was comfort food at its best. RL joined in the taste test and added more salt and some green tabasco to his sandwich segments. I was happy with the flavors as cooked, or hungry enough to be non-critical. Later on I spotted a package of frozen salad shrimp in the freezer and considered another round of sandwiches incorporating shrimp instead of turkey... or maybe not. I know for sure that we will celebrate National Grilled Cheese Sandwich Month again and again this month. Saute chopped onion and minced garlic in a lightly oiled pan over medium-low heat until softened. Add chopped kale and cook until wilted. Transfer to a bowl and set aside to cool. Use two slices of bread or one split roll for each sandwich. Spread one side of each slice with cream cheese. Pile some filling onto the bottom slice of bread. Top with another slice, cream cheese side down, and press together lightly. 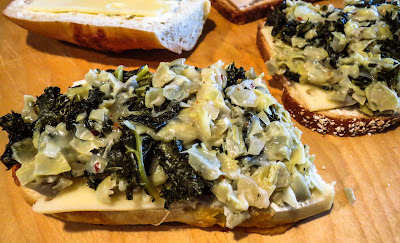 Lightly butter the top side of a sandwich and lay, butter side down, on a preheated heavy grill pan, OR melt a dab of butter in a heavy-bottomed skillet and add the sandwich(es). Toast on each side until the cheese melts and the bread is golden brown. Don't wait, slice and enjoy this treat right away. Check out the menu (link) at Monte Cristo, a Seattle food truck that specializes in gourmet grilled cheese sandwiches. Browse the site, you'll enjoy it and wish you lived in Seattle. 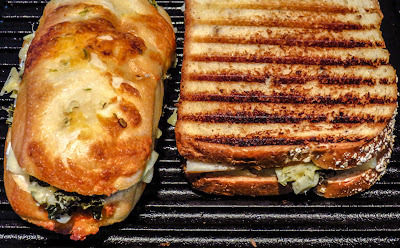 You could look for healthier grilled cheese makeovers at CookingLight (link).